Ryan Dineen creates energetic canvases that vibrate with intent. His paintings examine scenes and objects from the urban landscape – rusted out cars, bicycles, and construction sites – that, due to their perceived banality, often fail to capture not only our aesthetic imagination but our attention altogether. These representations ask us to reconsider our conventionalized neglect of the object in question. These works say: stop and look around, what you see might just be beautiful. A graduate of OCAD, Dineen was introduced to the world of graffiti early in his artistic career, leading to commissions by the likes of Redbull, Nike, and Apple. His most recent public installation was at the Spirit of York Distillery in the Distillery District, Toronto. 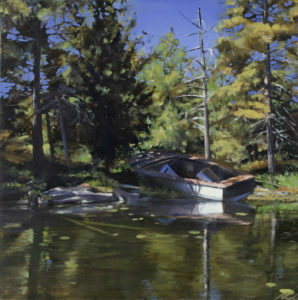 His practice now focuses exclusively on painting, and he has participated in many group shows throughout North America. Dineen is represented by Ingram Galleryin Toronto, where he held his most recent solo show, Stopwatch, in October 2017.